Spray Paint is produced through advanced technique and production process. It's a kind of fast drying thermoplastic acrylic aerosol paint, which is benzene-free, environment friendly. It has features such as simple construction, flexible operation, good atomizer, fast drying, plenty and attractive paint membrane, enduring color. And it has high integrated performance in weather ability, stickness, luster, hardness, flexibility, impact resistance and etc. These properties make it has excellent protect and decoration function. It is widely applied in decoration and repair for various substrate including metal, wood with treated surface, glass, ABS plastic and etc. For best results, clean surface of grease, wax, rust and dust. Scuff or lightly sand all glossy surfaces removing any unwanted bumps or flaking paint, then dust off. Prime raw timber or metal with Aeropak primer and allow to fully dry. IMPORTANT : Shake the can vigorously for one minute before use. Holding the can 30cm from prepared surface, begin by applying one light mist coat, spraying in a continuous motion across the surface working left to right. Pause, allowing the mist coat to set for 30 to 60 seconds, then apply additional coats working at 90° to the first coat. If a thicker finish is required, allow at least one hour between extra coats. When painting over existing paint always check compatibility. Clean any over spray with mineral turps or general-purpose thinners. For better long term storage, turn can upside down and spray until no paint is coming out. Spray unneeded product on to newspaper dispose to waste. Do not use near fire or naked flame. Do not puncture or incinerate even if empty. Keep in a cool place out of direct sunlight. Never spray at eyes or face. If swallowed seek medical advice immediately. can be harmful or even fatal. 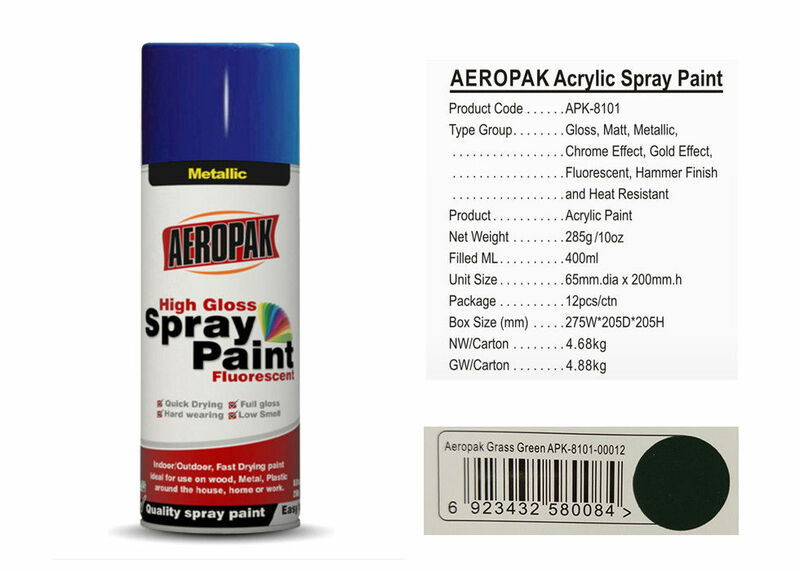 China Good Quality Aerosol Spray Paint Supplier. Copyright © 2018 - 2019 aeropaksprays.com. All Rights Reserved.